Product prices and availability are accurate as of 2019-04-19 01:15:01 UTC and are subject to change. Any price and availability information displayed on http://www.amazon.com/ at the time of purchase will apply to the purchase of this product. USB RECHARGEABLE BIKE FRONT LIGHT & TAIL LIGHT SET WITH AMAZING LONG RUN TIME - Stop wasting your money, SAVE Big Time with the USB Feature! All you need is a USB cord (included!!) 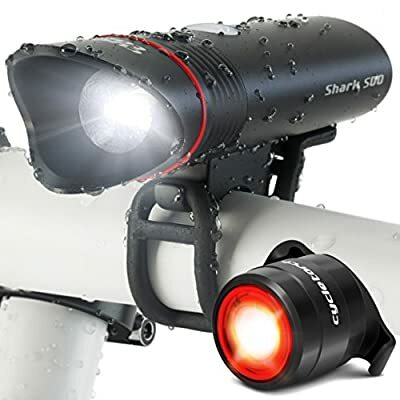 and a power source to recharge (Computer, laptop or a cellphone charger) The Shark 500 USB Bicycle Light comes with Smart Charging Technology and has Runtime of Up to 2+ hours on High, making it a Top of the line light. SUPER-BRIGHT BIKE LIGHT TO IMPROVE YOUR SAFETY - BE SEEN and commute in CONFIDENCE! Powered by a High Output CREE LED with 500 Lumens (SEE beam pattern images for reference) to ensure maximum safety for your day-to-day commuting in Flash mode and illuminate your Path at nighttime. Also comes with a nice USB LED tail Light BONUS, made of highest airplane grade aluminum, to keep you safe 360 Degrees. ATTACHES IN SECONDS, NO TOOLS REQUIRED & UNIVERSAL FIT - With a NEW REDESIGNED mount, Guaranteed to fit ALL bikes, Oversized Road Bikes, Commuter City bikes, or any Mountain & Kids bikes. No Tools required, leave your tools for bike repairs, Shark 500 bicycle light installs in under 5 seconds. Doesn't matter what bike you're riding, we've got you covered! FLAT BEAM SHAPE & WATER RESISTANT - Shark 500 Bike Light has ONE OF A KIND flat beam shape - Specially designed for Cyclists riding in urban environments. Drivers of oncoming traffic or other pedestrians will thank you for not blinding them. Also our bike light is IPX5 Rated, meaning 100% covered if you get caught in the rain. Still not convinced? ! It weights only 100 Grams, so when performance matters, Shark 500 is the best Choice! ORDER NOW WITH 100% MONEY BACK & SATISFACTION GUARANTEE - If you are not completely satisfied with our bike led light within the first year, we will replace it with a new one or refund your money, no questions asked, Our Customers Matter!